Geek Chat League Gelato 77 - Autumn! Si non potes reperire Berolini in tabula, ludens essetis non WIF. Hey, get your stinking cursor off my face! I got nukes, you know. What is a Geek Chat League? A Geek Chat League is a weekly discussion-group format for people who love gaming and enjoy talking about games. It is intended to foster depth and familiarity, producing engaging content and worthwhile interaction. Members get to know one another, establish shared interests, and generally develop a friendly and productive environment. Of necessity, each division of GCL is kept relatively small (typically between 12-16 members, though individual divisions may incline one way or the other). A tight-knit discussion group tends to function more smoothly than a free-for-all. It allows individuals to be heard and understood, and for each participant to keep up and enjoy multiple topics as the week progresses. The format is geeklist-based, and lists are not published to the BGG front page. Policy: If you're a lurker or have otherwise discovered GCL Gelato, feel free to read along with us and see what the members have to say on everything under the sun. If you have a constructive comment or something else you think would add to the discussion, consider posting it — if it's helpful, respectful, and polite to the discussion group as a whole, as well as to its individual members. Though you wouldn't know it by the temperatures in the Washington area today (high supposed to be around 88F/31C), I'm keenly aware that autumn has arrived. This is the change of season - summer to fall - that I feel the most, and always have. A big part of that feeling is, well, something like sadness and regret and the recognition that the passing of another summer also marks the passing of another year. Even New Year's Day doesn't feel that way to me. Maybe this is a holdover from student days when end of summer meant a new academic year - and the end for school-aged me of those days of summertime freedom. The regret certainly has nothing to do with the end of summer weather - I prefer cooler temperatures and autumn is maybe my favorite season. So - in broad terms, how do you feel about autumn/fall? Is it a good season for you, or one to be endured? Did/do you hate going back to school? Or was/is that something to anticipate and enjoy? I really have noticed the shortening days this year. My commute which starts at 7:00 AM was in full sunlight only a month ago; now it is dark. The retreat of the sun really brings home the passing of time. Is there anything else about the changes at this time of year that you really notice? Are you affected by the short days that are coming, or does it not bother you much? One of the good things about fall - and another way of marking another year really - is the sports calendar. As a kid in England, the end of summer meant the beginning of a new soccer season. In the US, fall is football weather (though now expanding football seasons driven by broadcaster demand begin before summer is over); I used to go to all of my high school's football games, no matter how bad our team or wet the weather. And baseball in October means playoffs and the Fall Classic (a nickname for the World Series). And in the US, fall becomes entwined with Halloween - trick or treating, haunted houses, hay rides, other autumnal activities. Not to mention the borrowing of that excellent German tradition, Oktoberfest. So what events do you associate with autumn? What do you look forward to in the season? As I said, the weather is one of the good things about autumn as far as I'm concerned. In particular early autumn can be very nice - somewhat cooler weather. Of course, there is plenty of rain and sometimes even snow that can come with autumn. But when it's a cool and drizzly day I ask myself whether I prefer that or 95F with high humidity, and I'll take the rain thanks. How do you deal with autumn weather? Is it a relief from heat? Or do you pessimistically see it as the prelude to crappy winter weather? We love to travel in autumn. Airfares are down; hotels are easier to find and rooms are cheaper; there are fewer tourists at the spots we want to visit. Do you like vacation in the fall? Are you able to do it? Also - in my vassal/skype World in Flames game I had a thoroughly depressing March/April '42 turn for the Germans; Russia was lashed by storm and blizzard the whole turn, and the United States declared war and with Britain, landed in France! But the Germans and Italians were able to react quickly and I think the Allies will be evacuating. Japan then declared war on the US and took Samoa and the Philippines. Cuba Libre PBEM and Andean Abyss PBF games are continuing. 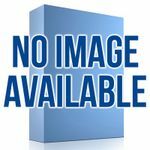 Roger's Reviews: check out my reviews page, right here on BGG! An interesting week of gaming. Tuesday is my usual RPG night, but since we didn't have quorum, we played a four player game of Arkham Horror. Talk about a flashback to the late 80s! I last played this before 1990 when I was living as a student above a shop in Victoria. I still have my copy, but this play was on my friend Dave's copy. I'm still persuaded Chaosium doesn't write rules well (I certainly felt that way about Credo as well), but it was a fun romp through yesteryear. And unlike the current incarnation of Arkham Horror, you can finish this game in a couple of hours. Wednesday saw Andrew return from hibernation and we played a CC:E scenario from the Normandy battle pack. He wanted to be the Germans and I let him. I set up the Polish units with the HMG on the crest of the cliff in a trench and the Major with another weapons team in the building right below with an LMG and then string wire across to block the road and cut access to the (for me) right side of the map. Meanwhile, on the left side I had split the two teams and the other squad on top of the ridge also in trenches, and last but not least sitting in a forward position alone atop the cliff (but still in radius of the Major), one of my two squads. This gave me a reasonable field of fire, although it was of course dark with all that entailed. Andy pushed slowly down my left and was able to take out one of my two crest positions, taking out the squad and team in the melee, but was unable to really push past and didn't score very many exit points that way. Meanwhile, my artillery was wreaking havoc with good rolls and the casualties mounted - and with it, the VP for the Polish, which at one point went past 20. In the end, although the Poles had a lack of fire cards in the early going, the timely and to a great extent lucky artillery strikes, which caused a lot of broken units, and therefore delays, allowed the time marker to climb to sudden death, ending the game with a solid Polish victory. In the aftermath, Andy figured he should have been more aggressive in trying to take out the two crest positions on my left, as although the terrain was difficult, there was little net difference in running up the hill into a hail of bullets vs trying to sneak past with same, and could likely have caused that flank to be an express road to exit VP. This was my 60th play in the Combat Commander series (including Pacific), so I'm 60% of the way to completing the 100 Game Challenge. After our CC:E scenario, I asked Andrew to teach me Cuba Libre (more specifically, how to play the COIN system). I'm excellent at learning a game when someone shows me how, but left to a rulebook and having to read it I'm lousy, and I hadn't had the chance to sit and fiddle with it (nor A Distant Plain which I received at the same time). We played until the first propaganda card just so I could see what happens. This quick and dirty learning of the game let me (finally) hop into the PBEM game with Jon, Wendell and non-Gelato player Michael. So my initial impressions of COIN are positive. I note that I haven't really played Andean Abyss (I joined and bailed on a pbem game because I didn't understand how the game worked), so Cuba Libre really is my first exposure to it. I can see some of the layers of abstraction in the system, but I think it holds together well. The COIN system really is on the cusp of the wargame boundary, and I think represents the start of a more holistic category of conflict simulation where it's not just about troops on the ground. Speaking specifically about the history in Cuba Libre, I can't say that I know it well enough to dissect it on the game level. There was a fabulous article in the New Yorker last May, The Yankee Comandante, that filled in some of the gaps for me as well as giving some interesting flavour to my knowledge. At the moment, Cuba Libre gets a from me. Over the course of the week my wife has been encouraging games after dinner with my daughter, in part for being something we do together, and in part to play games while speaking French. So some good gaming. 1989 - two games, new game with our very own Tommy. Twilight Struggle ladder game on ACTS - my opponent has vanished. 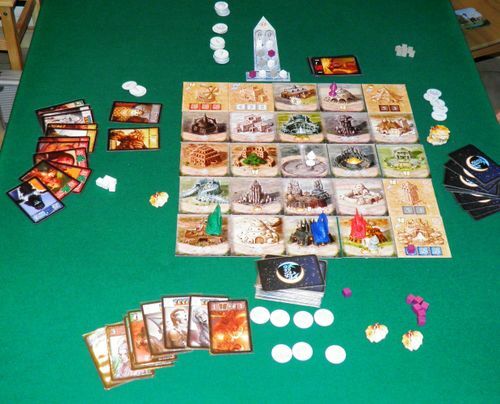 Here I Stand - looks like it's going to do die an ignoble death as the replacement player has not kept up. EuroFront II - the Spanish Civil War scenario. Busy as hell at work this past week, then out of town this past weekend, so not much gaming happened. I did get around to my second session of Paths of Glory with one of the guys from my club. We've been running those sessions on weeknights when the wives have their own activities scheduled. So far, I'm holding my own as the Central Powers. This is the first time I've ever played PoG, and it's one of my opponents favorite games, so I figured he'd have me on my heels on all fronts. But PoG isn't really that kind of game - it kind of settles itself into a natural equilibrium, and it's up to one of the players to do something stupid to cause the game to take any sudden turns. Since neither of us have done that, the game proceeds apace. The Western Front is static, with the Germans deeply entrenched at Sedan, but unable to take Verdun, and unwilling to try and hold Antwerp from the BEF and British reserves. The Eastern Front has more promise, as I've got the the three VP cities I need to destabilize the Russians, with Warsaw, Riga and Vilna. Hopefully that'll get them teetering nicely and save my hard-pressed Turks. The Ottoman Front has been annoying, but I've got as many forces as I can stacked at the right pressure-points, hoping they'll hold out. I think we've probably only got two more sessions before it's decided one way or the other. This is actually pretty fun. The rules are really short, and easily digested. It's, dare I say, a beer and pretzels type of wargame. Maneuver is important, range is important, but there are no LoS restrictions - you can fire through any ships you want. For close-quarters galley sea combat, this seems a little too abstracted for me, especially since it applies to both gunnery and small-arms fire. Nonetheless, the wide-open rules allow for just a total maelstrom of fighting with so many ships on the map. I've just started the fire combat, after maneuvering both side into as wide a front as possible. With galley combat, the cohesion of your line is vastly important, as getting around behind the enemy ships is catastrophic for them. We'll see how it goes! I have no idea why I bolded and centred the above. The entry certainly doesn't merit it. - he likes the map, and points out buildings he likes. He's starting to get the idea that maps are representations of real places. Yesterday he asked to go to Paris someday. Since I owe his mother a trip there, I acquiesced. Plus, nobody doesn't like saying "Pompidou." My second almost-game is my first foray into Vassal. Roger has graciously offered to hold my hand while I do my first computer-based gaming since Civ II on my old PowerMac. 1989: Dawn of Freedom has been on my shelf unplayed for over a year, so I can't wait to finally dig in. I promise I'll jump in on Tuesday, Roger! Although only two of my gaming buddies had time to attend, we still had a fine game night. It started with a game of Evolution (2006); a few years ago, I bought a copy from the designer at Spiel, but found the game only mediocre at best. But I got a Geekmail from the designer, asking me if I would be willing to playtest an improved version. 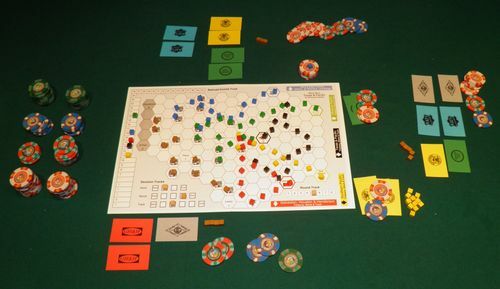 Well, we tested the 3rd revision and it now looks as if it is a fine family game. Further tests (especially with my daughter) will follow. Kurt never played Blue Moon City before, and I haven't played that one in ages, so we re-built the city of the Blue Moon people. In fact, this is really a good game, and I have totally forgotten about it! After that, I voted for Texas & Pacific, a Winsome Games Special Essen Edition from Harry Wu. As usual, Wu's games are brutal and sometimes equal more a math exercise than a game. I wouldn't dare to play this with more than 3 players, as you need time to calculate everything and after the game, we all agreed this is not really a winner. But interesting, nevertheless. Please note the BGG poker chips! 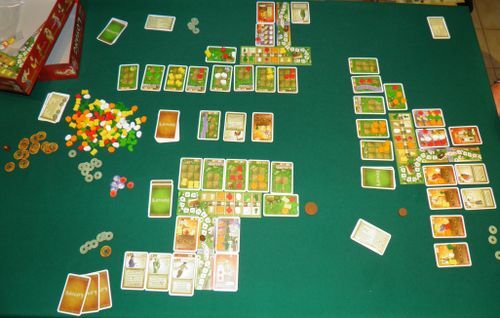 At the Gates of Loyang is one of these 'heavy Euros' I had laying around, still unplayed. So we rectified the situation and gave it a try. Well, basically a good game, but your success depends a little too much on the cards you get. At least, I dare to say so after only one play. But the others agreed and I fear this will become a dust-collector in my collection. At least, the veggi-meeples are nice. So after that - it was already 10 pm - Kurt suggested Eclipse! After reading about Cindy's 6 player game last week, I was really excited to play the game! Three player isn't as epic as 6 I guess, but nevertheless, we had a great time! This is really a wonderful game, with many elegant interlocking mechanisms! Only one game played this week and here is what i wrote about into on the Solitaire games on your table list. 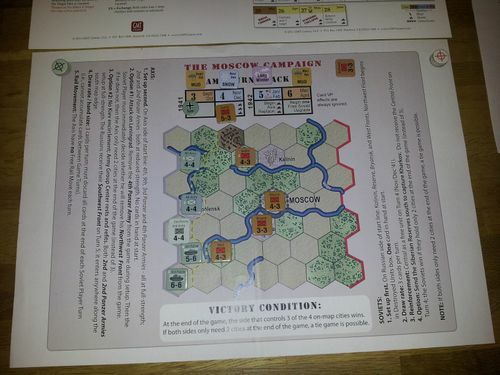 Soloed the short "The Moscow Campaign" scenario for this game. 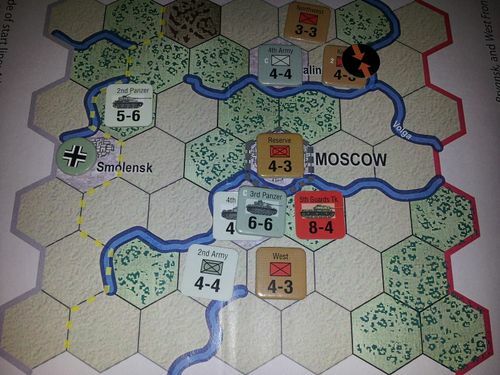 it is a fun little puzzle scenario, that gives you a feeling somewhat similar to Battle for Moscow (second edition), but adds a bunch more desicion making. The low number of units/counters makes every move count. With four cities on the map and 3 needed to win(unless you use some of the options available) you need to move fast to win. As the Germans it is a puzzle how to get strong attacks versus the few but well defended Russians. With 2 of four turns being winter the Germans need to combine units in the attacks to get results. The scenario at setup. Putting the strong German Panzers in the south to rush the frontline Russian unit and treaten TULA early on. Also done to have the fast moving Panzers where the terrain is clear. The two southernmost German stacks both contain two Panzer units. This was the situation at the end of the game. Last turned became winter too, but the Germans got some good COunterattack results which led to the capture of the northern town, and a strong attack combined with a card that removed two Russian counterblows led to the fall of TULA south of Moscow. With 3 cities held and withstanding the last Russian attacks the Germans won the scenario. I hope GMT and Carl includes this and the small Ukraine scenario in the reprint of this game. PS: This scenario is available as a free download on Victory Point Games websites. I printed them out on A3 sized paper. In other events me and the wife took a weekend trip to Aberdeen and did some shopping. Also visited Dunnottar Castle and had a brief stop at a warmemorial raised in honour of the people of Stonehaven district that fought and died in WWi and WWII. - As Wendell noted, we are progressing nicely with our FitS session and I think it is safe to say we are both rather intrigued by it. I for one have not played anything quite like it before. The mechanics and nature of the Pacific War makes for some interesting, probe-like thrusts. We really do not feel comfy with the game as of yet though and so will shuffle along as best we can until I meet my inevitable doom ( ). Having lost my US carriers on Turn 1, I opted to remain on the defensive in Turn 2 and await, as Chris noted last week, the American industrial capacity to even the playing field. So another screen of airplane bases dot the Pacific to act as a tripwire. I also moved a new carrier Task Force with Marines down to Samoa to put them within striking range of Japanese thrusts in that direction. - Cuba Libre is on the go as well as Wendell and Roger mentioned (henceforth renamed Wenger or perhaps Rogdell). That should be a hoot. The game also replaced my Seven Pines solo adventure from my table. I got a good taste of the latter and will return to it in time. It just fell victim to the plethora of distractions from last week. One being CL of which I pushed through a solo session to the first Propaganda card. It moved along very quickly (much more so than my first forays into Andean Abyss). Viva! - I have been getting back into the podcast "scene" by which I mean loading up my iPod (The Greatest Present Ever) and listening to them while I cook or do the dishes. The latest "Guns, Dice and Butter" featuring a round table discussion on US Civil War games really did have me LOL at times. - Finished read the Che biography (Anderson). All in all a very good book. I think I got a strong impression of his life and some idea about the goings on during the Cuban Revolution. 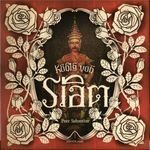 Now I am reading Vietnam by Stanley Karnow along with Modris Ekstein's Solar Dance. - A flu-ridden house this past week. Tired of physical disruptions. Bah! Well, after a week of sickness and general discomfort I think I'm on the mend and life is returning to "normal." Last week was a birthday week and I got flooded by games from friends both near and far--which is great--but it also means that I will definitely give away/sell a bunch of titles in the next month or so (the fact that I have potentially two kick-starter games upcoming this month puts even more pressure on the shelf space!). I had a chance to play Spot it!/Dobble when I joined the London on Board group during my trip the UK. It was a great filler and a lot of fun and I knew that I wanted to get a copy for the local group. I played several matches over the week and each had it's fill of of good natured yelling. For my birthday I impulse bought two games, 1775 and El Caballero with the small pile of birthday cash that came my way. 1775 was pretty fun. It's a lighter wargame, but there are some good decisions and it seems like a good way of getting folks into the genre. Cati enjoyed our first outing with the title and I imagine we will go through it a couple more times but it's also clearly a little on the simple side for us. If this game gets some local play I'll hold onto it, otherwise I think it would be a nice gift for a couple of former game groups. El Caballero left us both confused. When we first started dating we played a lot of Carc on lunch breaks (we both taught for a small progressive school). We haven't played much Carc since but our copy is well-worn and it still comes out when we have visitors. I've wanted to play its heavier older sibling for a long time but it's always been just hard enough to get that it never happened and when I saw it for 30 bucks a the store I couldn't resist. My feelings on the game are decidedly mixed so far, but I may be doing a rule wrong. It feels too short and too small right now. Planet Steam was Cati's gift to me and we broke it out for our first game last night. So far, I really like what I see. I was a big fan of MULE back in my NES days and PS seems like a smart adaption. It's perhaps a little less opaque than Container but in a way that could produce an interesting game on its own merits. I expect it to get a few plays this week. Finally, we had folks over Monday and Saturday. On Monday we played Container (yayayay!) and then on Saturday we played a game of Terra Mystica. Container game was solid, but a little scattered as most of the players were new. It's difficult to play well with that many new players so I was content to ride the seemingly random tides of inexperience. We also introduced some folks to Terra Mystica who really really loved it. TM, as ever, is a crowd favorite. I'm more convinced than ever that it is a mediocre game at heart, but packaged brilliantly within a tantalizing array of fun currency conversions and colorful themeing. Without paying much attention to anyone else I drove the Cultists to a relatively smooth victory (though the Swarmlings managed a close second). Cati and I may be instituting a game-a-night policy to keep us off of screens past 8 in the evening--we'll see if it happens! As a devoted student of this campaign a purchase was inevitable.